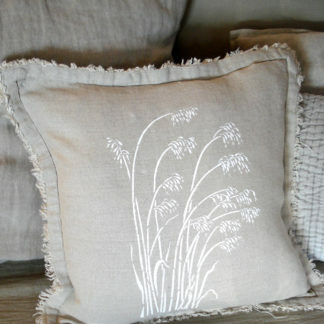 The Large Wild Oat Grass Stencil is inspired by long, graceful wild oat grasses with their tall swaying stems and full, slightly drooping, antennae-like seed heads. 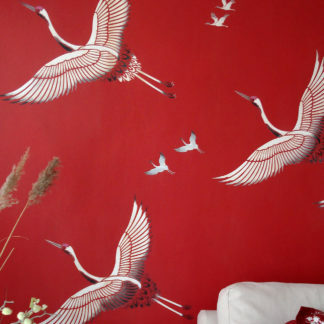 This beautiful and elegant stencil will give a soft, sophisticated designer touch for both walls and fabrics. 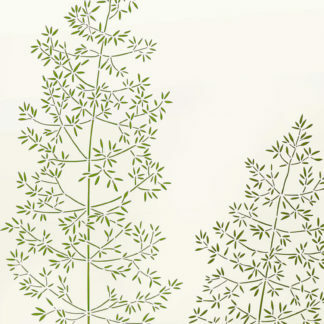 Use on its own or in conjunction with our other beautiful wild grass stencils to create beautiful wild grass murals and effects. 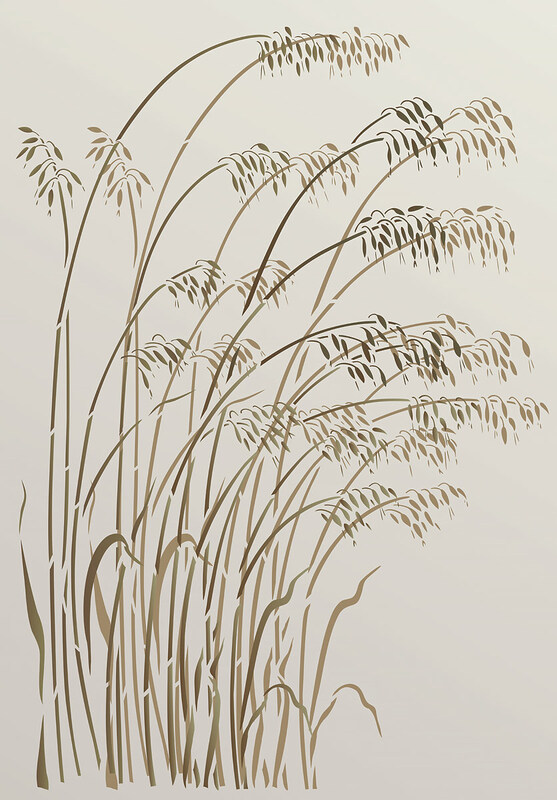 The Large Wild Oat Grass Stencil is a single sheet one layer stencil with a large graceful motif of swaying wild oat grasses – see size and layout specifications below. 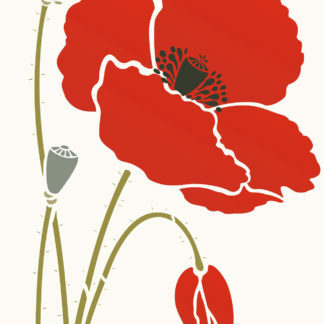 Stencil in natural tones of gold, ochre, brown and moss greens on light natural coloured backgrounds, or in light ‘silhouette’ colours on darker contrasting backgrounds. 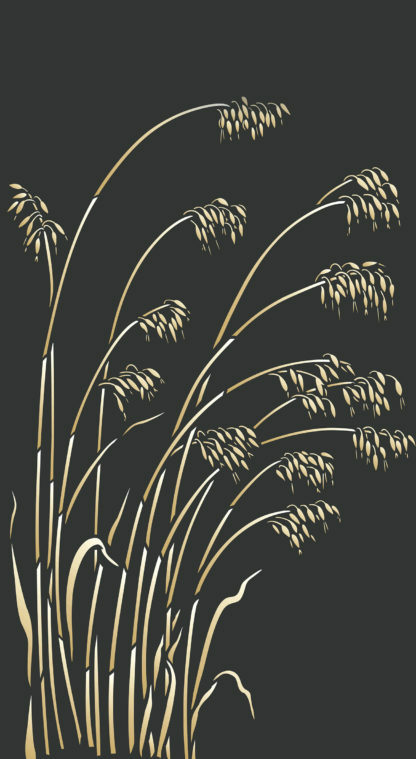 Above top – the Large Wild Oat Grass Stencil on a black background, stencilled in a two-tone technique in Ice White and Butterscotch Stencil Paint (see techniques bottom right). Above – the Large Wild Oat Grass Stencil repeated in an overlapping style with staggered heights. Shown in Coffee Bean and Vanilla Stencil Pant on a sludgy, brown-grey background. Muted colour palettes are perfect for this design and can be used in a variety of colours to the same effect – try this on decorative panels or around a room under dado height or on stairs. 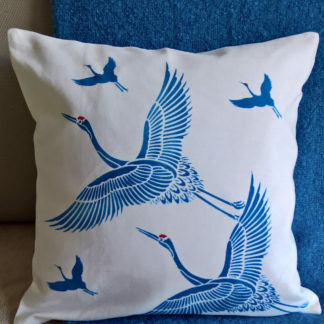 Above – the Wild Oat Grass Stencil repeated in the light to dark tones of Charcoal, Arctic Grey and Ice White Stencil Paints on a graduated blue-grey background. 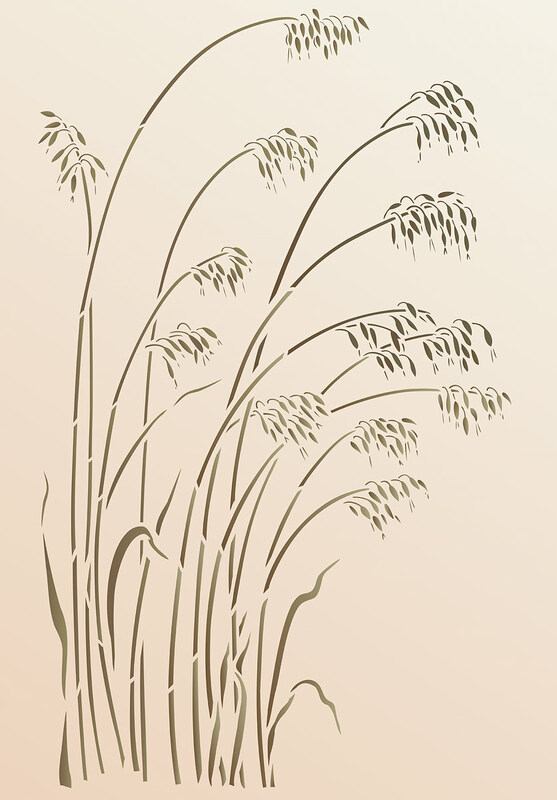 Above – the Large Wild Oat Grass Stencil shown on a pale apricot to cream graduated background in Mocha and Coffee Bean Stencil Paints. See graduated techniques below. 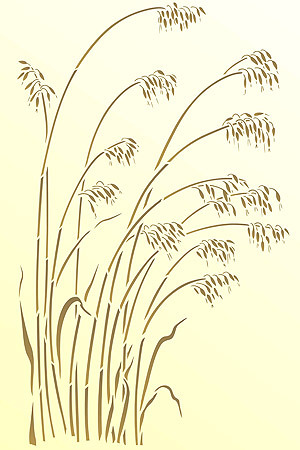 Above – the grass motif of the Large Wild Oat Grass Stencil on a lemon-cream coloured background, stencilled in Mocha and Latte Stencil Paint. 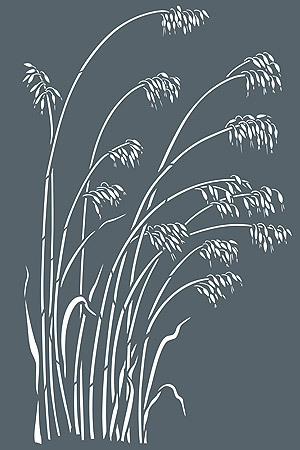 Above – the Large Wild Oat Grass Stencil in Ice White on a slate grey background. 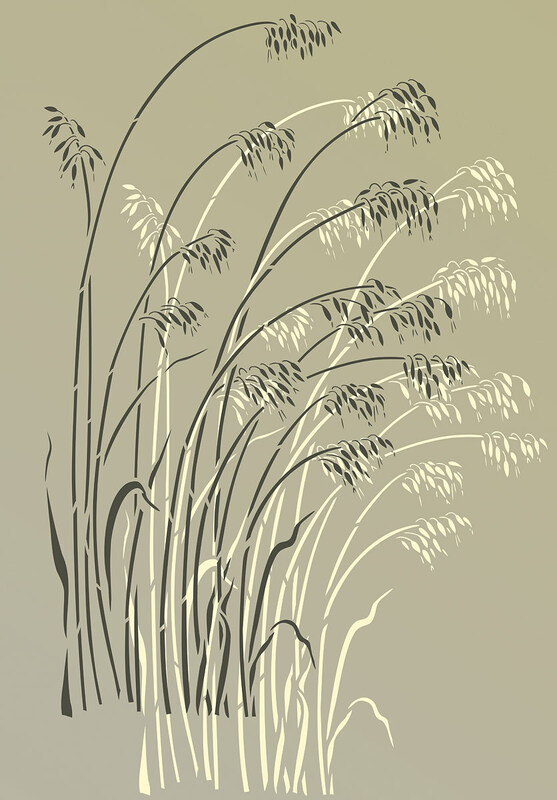 Above – the Large Wild Oat Grass Stencil repeated in a ‘shadow’ overlapping formation, stencilled first in Latte and Mocha and Coffee Bean Stencil Paint. 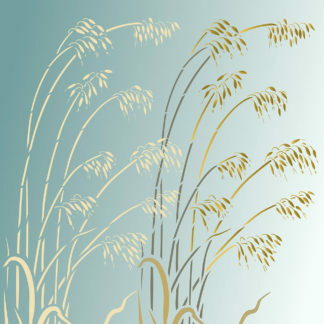 This single sheet one layer motif stencil is made of 125 micron mylar, with a large wild oat grass motif on the one sheet. 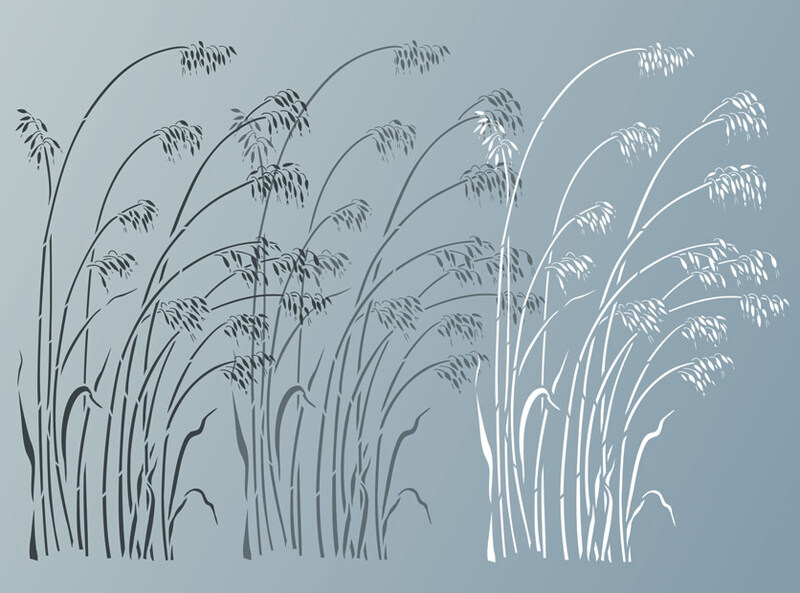 Whole grass motif is approximately 84cm (33″) tall x 50.6cm (20″) across at widest points. 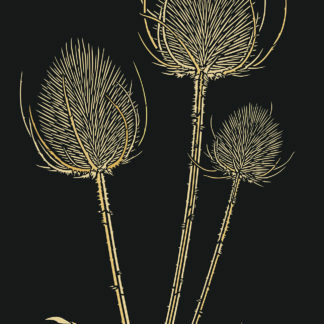 The seed head groups are up to approximately 10cm (4″) wide x 7.5cm (3″) deep. 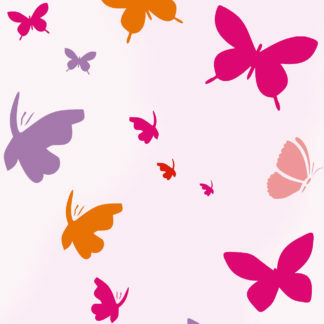 Sheet size 90cm (35 1/2″) deep x 60cm (23 3/4″) wide. 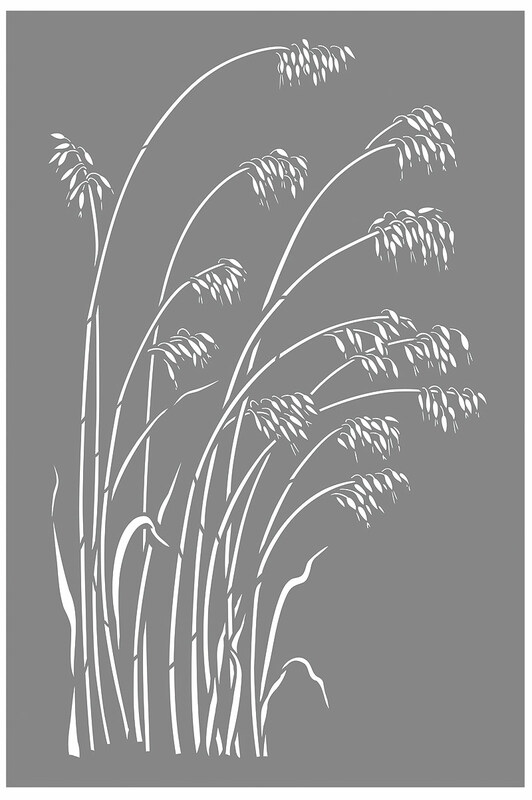 Left – the layout of the Large Wild Oat Grass Stencil.